products photographed: kerastase elixir ultime* paul mitchell forever blonde conditioner* tigi bed head 'dumb blonde' toning protection spray tigi bed head 'dumb blonde' purple toning shampoo paul mitchell forever blonde dramatic repair spray* so i took to twitter last week and asked if anyone would be interested in knowing what products work well; taking care of coloured blonde hair, and the answer was a resounding yes. now i know i could have took a million and one great 'pinterest-worthy' images to show off my hair care products but then i thought, it's haircare does it really matter? i would much rather focus on the content because showing an image isn't going to tell you whether the product is good or not. so let's tackle them one product at a time: hair oil is a must have if you have coloured/treated hair, it keeps those dead ends sleek (good ol' optical illusion) but not only that it also helps keep the fibres in your hair follicles structured so they are less likely to break as a result of being weak; not only from the hair dye but then heat if you using straighteners or even just quickly drying your hair. kerastase elixir ultime is a luxury product in my eyes with the high price tag of £31, BUT i've had it almost a year now and you can see how much i've used. a little goes a long way and when i know i'm going to be doing a lot of work on my hair it's great to use this and know i'm giving it some TLC. you have to remember sometimes your hair should be approached as you would with your skin. a great foundation of products will give you better results just like how your make up lies, or in this instance how your hair looks when styled. i think they key for my hair is i was to keep my hair blonde but i want to make sure i'm keeping it constantly repaired. my worst nightmare is when you hear horror stories of peoples hair which has just completely broken off due to how damaged it became from colouring. recently i have switched to balyage to give my hair a break from a full set of highlights. which now means there will be longer intervals between needing my hair coloured maintained because it's more of a natural shade on top. 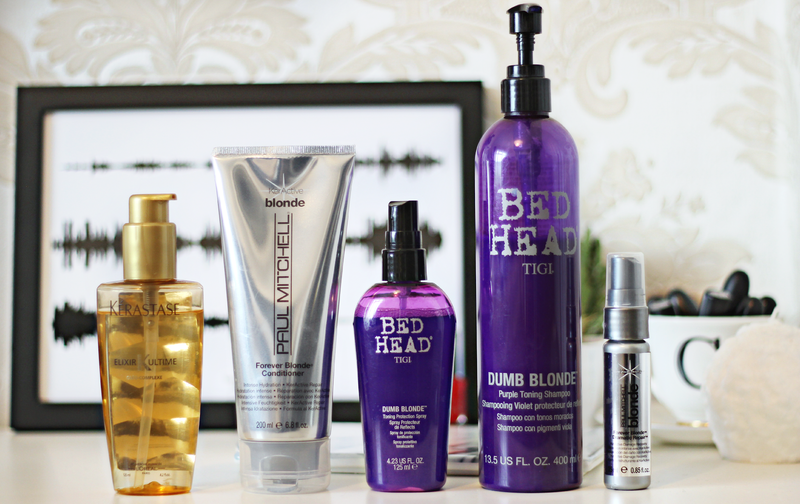 even so i still want to have that feeling of fresh blonde locks, so i love my tigi 'dumb blonde' or my paul mitchell 'forever blonde' sets for making sure i don't end up with warm, yellow toned strands of BLEURGH. once a week i use my purple toning shampoo, and letting it sit for that extra 5-10 minutes makes a huge difference in the tone but doesn't leave me with an almost silver/purple tinge that some cheaper purple shampoos can do. the other alternative is my toning spray which is great if i notice i have only a few bits that are looking warm, i can spray it onto the areas and dry it in and that does enough to keep the warmth at bay. plus it smells of pineapple. so so, good. the paul mitchell conditioner is great for giving my hair a great dose of hydration which is necessity as colouring your hair can leave it dry. what i'm trying to say is even if you're not a natural blonde like myself, you don't have to sacrifice the quality of your hair for the sake of a colour. maintaining and investing in some great products means you can still have the shine, softness and sleekness of natural un-treated hair. what do you think? will you be investing in any of these products? do you use any already? let me know! I have blonde hair and I honestly don't know what I did before I discovered purple shampoo. Such a life saver, especially in the summer months when your hair has gone brassy from sun damage and chlorine! I always recommend it to my fair haired friends!